I bet you thought I’d never get here, huh? So I wondered how long it had taken me, in my tremendously stilted reading & blogging schedule, to read through this entire book. 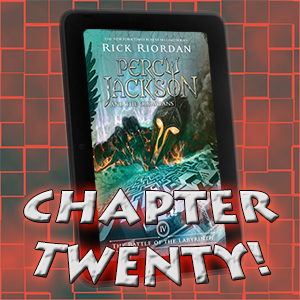 I knew it had been a while, but I was shocked to find out I started this particular volume of the Percy Jackson series all the way back in September! Yikes! It’s definitely not the fault of the book. I think The Battle of the Labyrinth has been my favorite in the series so far. So things are still weird between Annabeth and Percy, owing to Luke’s situation. (I wonder if Luke might ever be turned around the way Chris Rodriguez was, but he was mind-screwed by the Labyrinth whereas Luke just seems to make poor choices.) Now Annabeth will have even more to deal with soon. You do NOT insult Hera and expect the goddess won’t get snippy. Sure, Hera helped at Geryon’s ranch (I guessed right! ), but her lack of empathy for Annabeth, and her disregard for Nico, puts Annabeth in Camp Justifiably Upset. I’m curious to see what the fallout from all that shall be. I’m also curious to see what Luke’s got in mind at the end of the book there. What did he find out? What is–he thinks–the only way for Percy to stop Luke? How much of the Underworld’s alluded-to cheese fondue supply does he have access to? I must know! That will be on top of the bombshell Poseidon drops: Typhon is waking up, within the year. Ahh, terrible foreboding: it makes such a great birthday present! Well, okay, technically he also gives Percy a sand dollar for his birthday, which he says will buy a lot, in the right situation. What will it buy? How? Percy will apparently know when the time comes. Hey, why can’t people ever explain their frigging gifts? Darned mysterious gods. New theory, thinking back to the winged shoes from the first book: Whenever someone gives a gift that they do explain the use of ahead of time, it’s going to wind up being cursed. So, as I said, I really quite liked this book. Things ramped up with the whole struggle, and the Labyrinth itself was a nice looming mystery/threat. Kronos came back in real form, Grover actually found Pan, and we got a big battle at the end. Plus, I really did not see the whole Quintus=Daedalus thing coming, and that reveal worked really well for me. As you may remember, I was especially excited about this book’s particular quest format, as it looked like it would start out with a good old-fashioned D&D dungeon crawl through the Labyrinth, with Annabeth as the party leader. While that aspect didn’t quite develop in the way I’d hoped, and Annabeth was forced to take a back seat to Percy, I still enjoyed it. Just don’t get me started again about Calypso.